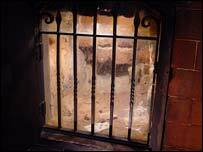 A mummified severed hand has been stolen from the pub where it was found almost a century ago. The relic was taken from its display case at the Haunch of Venison pub in Minster Street, Salisbury, between 1815 GMT and 1915 GMT on Monday. The hand, which clutches a number of 18th century playing cards, was found when the pub was renovated in 1911. A police spokesman said: "This is a local tourist attraction and needs to be returned to its rightful home." The hand is thought to belong to a gambler caught cheating at cards - his ghost is said to haunt the pub, which was built in 1320. The pub's owner, Arnaud Rochet, said: "If anybody has any information please give us a call. It is part of the history of this place. "I can't believe someone has stolen the hand - I'd never think something like this could happen." Anyone with information about the theft, or who knows where the hand is, should contact Wiltshire Police. "I can't believe someone has stolen the hand."